This versatile backpack features a 600 Denier polyester fabric with a heavy vinyl backing. Triple front pockets and side bottle holders make this 12-1/2" W x 16 1/2" H x 8-1/2" D backpack great for day hikes, school, work, or just knocking around. 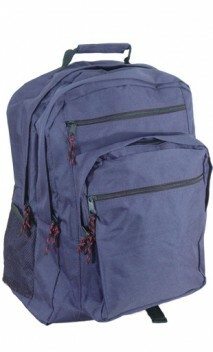 The back pack has adjustable straps for comfort and a large open compartment. The imprint area is 7 x 6 inch so your design will look great! BO - 12"" x 0" 4" x 4" 12" x 12"
Testimonials from customers who ordered item B450 and left a comment in their survey.